Yellowstone National Park is the first and oldest national park in the world. Located mostly in Wyoming, approximately 5% of the park is covered by water, 15% is grassland, and 80% by forest. The park encompassing about 2.2 million acres and along with the national forest lands nearby, make up one of the world’s last intact temperate ecosystems (all its major species of plants and animals are still present). Yellowstone National Park has thousands of active thermal features, including over 250 active geysers and is home to the famous Old Faithful Geyser. Approximately 3 million people a year visit this spectacular park. They come to experience some of the best that nature has to offer. A few of the must see attractions in the park may include: Lower Falls of the Grand Canyon of Yellowstone1) Old Faithful / Upper Geyser Basin which happens to be the most popular attraction in Yellowstone. 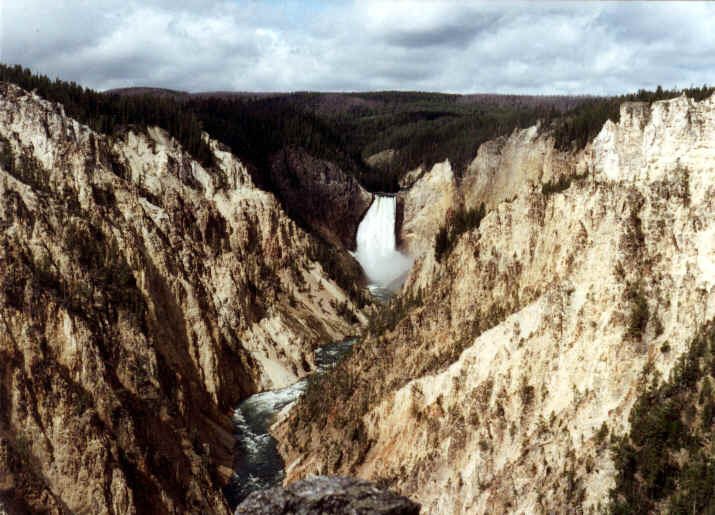 2) The Grand Canyon of Yellowstone. The Lower Falls of the Grand Canyon, at 308 feet high, is one of the most photographed features in all of Yellowstone. 3) Mammoth Hot Springs is where large quantities of rock are dissolved by hot water, and a white chalky mineral is deposited on the surface. 4) Yellowstone Lake which is the largest high-altitude lake in the US and is quite beautiful. 5) Norris Geyser Basin is the hottest, oldest, and most dynamic of Yellowstone’s thermal areas. 6) Hayden Valley is the place to go to view the wildlife. You may see bear, bison, elk, moose, wolves and many types of birds to name a few. Yellowstone National Park is where – simply stated, the scenery is breathtaking and the wildlife is abundant. The Park has five entrances and over 370 miles of paved roads. The Grand Loop Road will take you to all the major attractions around the park. During the peak summer months, these areas are quite busy. There are many activities to do in and around the park. The most popular are auto touring, camping, hiking, wildlife viewing, picnicking, whitewater rafting, fishing, boating, backpacking, biking, horseback riding, and photography. There are also a variety of ranger programs, historical information and nature tours available for your participation and enjoyment. Lodging and camping facilities are located at various locations around the park. Reservations are recommended especially during the peak vacation season. What a wonderful place! Yellowstone National Park has many unique attractions that you will not find anywhere else. Lots to see and do. Keep your eyes open for the wildlife. Visit the Yellowstone National Park website for more information.